54cm white freestanding cooker is rated 3.3 out of 5 by 7. 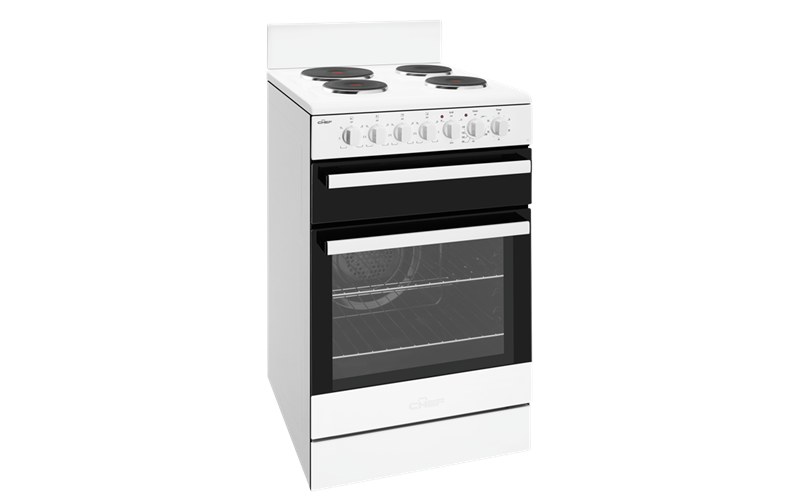 54cm white freestanding cooker with fan forced oven, timer, light, separate electric grill and electric hob with 4 solid hotplates. Rated 2 out of 5 by Anonymous from it isn't top of the range, but does a great job. A little noisy from the protection plate above the grill when the oven temp is above 200c from the oven fan and the grilling tray is hard to slide in & out when checking on the food ,the hot plate coils seem a little flimsy its just a matter of time to see how they hold up. Rated 4 out of 5 by Eddie T. from The timer bell doesn't work. Sure it counts down but the ring at the end is not audible, so it's pretty useless. One hotplate seems to be considerably less hot than the other three. If this is intentional, it's not mentioned in the manual, so I can only assume it is not functioning properly. The rest of it is great. Rated 5 out of 5 by Goga from Love this stove. Cooks the best baked dinners! Never had a fan forced oven before and would highly recommend it. Just wish I could get element covers for top of stove to protect from oil spitting and discolouring. Rated 2 out of 5 by Anonymous from The stove was described as having a height adjustable grilling shelf - the stove that was delivered did not have this feature. Rated 2 out of 5 by bobb from Not so happy 3 elements in 6 months, not happy Jan. Will be contacting Chef to try and sort this out.